There's a lot of things inside the box of a new Canon 5D Mark II, but to get started shooting right away, most of it isn't necessary. Just make sure you have your body, lens and memory card, along with the battery, battery pack and camera strap. For now, the rest can stay in the box. You're not going to get anywhere unless your battery's got some juice. 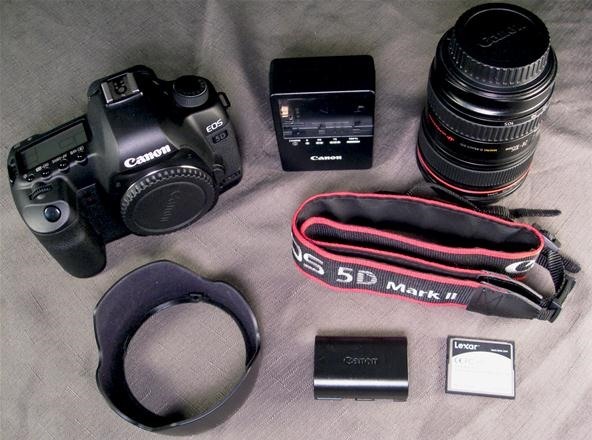 Bundled with your 5D Mark II is an LP-E6 lithium-ion battery pack and an LC-E6 battery charger. Some of you may have the LC-E6E charger instead. The only difference? The compact LC-E6 plugs directly into the wall via flip-out prongs and the other uses a power cord. I have the compact pronged version. If there's a protective cover on the battery, remove it and attach the battery into the charger. Using the arrows to guide it in, set it down into the grooves just right of the contacts on the charger. Once it falls into place, push it to the left until it securely snaps into place. Now, flip out the prongs on the back cover (or attach the power cord if you have the LC-E6E) and insert it into nearby receptacle. The charge light should immediately begin to flash an orange color, once per second. That means your battery is under 50 percent charged. Once it starts blinking twice per second, it's somewhere in-between 50 and 75 percent, and three times per second is above 75 percent. Once it's fully charged, the light will turn a steady green, which should take about 2.5 hours if it was completely exhausted. If you live in a cold climate, it could take up to 4 hours to completely charge. Disconnect from the power outlet and detach the battery. While your battery is charging in Step 1, you should be getting your camera ready for action. Since this article is about getting your 5D Mark II up and running to start shooting right away, you're not going to be using a tripod, which means you should probably attach the camera strap—for safety reasons. You don't want to drop it before you take your first picture, do you? Lay out the strap and make sure the ends are not inside the buckles. Before attaching to the camera, put the strap around your neck with the Canon logos facing away from the skin. Make sure to attach to the camera so it remains like this around your neck, without any unnecessary twists in the strap. Place the end of the left side of the strap through the bottom of the eyelet on your camera, beside the mode dial. Bring it up and pass it through the plastic holder and into the buckle. Pull the slack and make sure the strap will not loosen. Do the same thing for the right side, attaching to the eyelet next to the LCD panel. Place the strap around your neck and make any necessary adjustments. 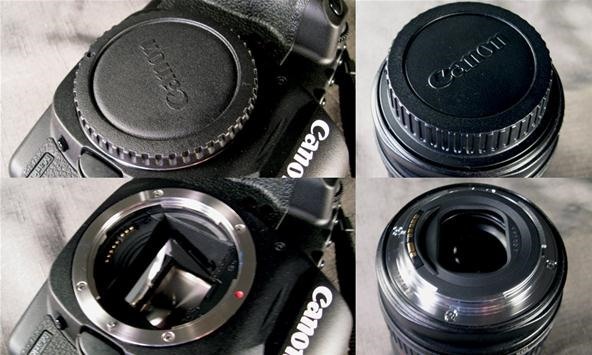 No matter what kind of lens you have for your 5D Mark II, the process is the same for mounting to the body. Have your lens ready to go, because as soon as you take the cap off of the body, you'll want to be able to do the same with your lens and attach as soon as possible, to prevent any dust particles from intruding into the interior of the camera. Remove the cap on the body by rotating counterclockwise toward the shutter release. Quickly remove the rear lens cap by turning counterclockwise. Then, attach the lens by aligning the red dot on the lens to the red dot on the camera's bayonet mount, gently placing it in until it falls into position. Twist the lens clockwise until it locks into place. Screw both caps together to keep the dust out of them. If you have a lens hood (EW-83H), attach it with the wavy edge facing outward. Align the single red dot on the hood to the tiny red line on the front of the lens, then turn clockwise until it snaps into place. The red circle and line symbol on the hood should now be aligned with the tiny red index on the lens. Make sure it's seated properly. If not, you may need to try again, making sure it's threaded correctly. The lens hood could also be put on backwards to save room when storing the lens. Then place the focus selector switch on the lens from manual to autofocus (AF) mode and make sure the Image Stabilizer switch on the lens is turned to the on position. You won't be able to do much without the battery, but still, to save time it's best to do this while you're waiting for the battery to fully charge. No matter what kind of CompactFlash card you have, it goes in the same way. Open the card cover by sliding in the direction of the arrow, toward the rear of the camera. On the underside of the cover is a drawing to help you figure out the position of the card. 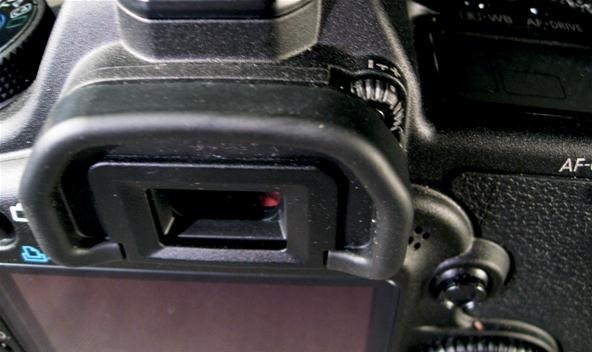 Make sure that the top of the CF card is facing the rear, with the pin slots facing down into the camera. 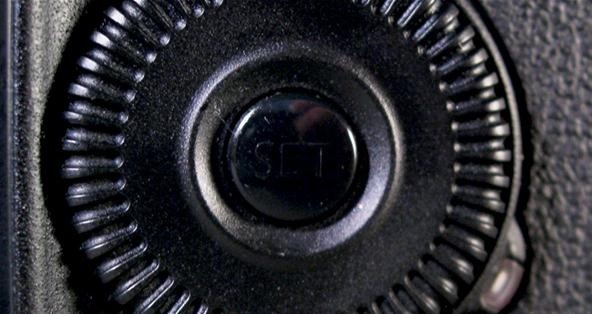 There's a lip on the opposite side of the pin slots that will be facing toward the front of the camera. Slide the CF card in and push down until it's properly seated and the card ejection button pops up. Close the cover and slide it back into place, snapping it shut. Now you've got everything done that you can do before needing the battery. 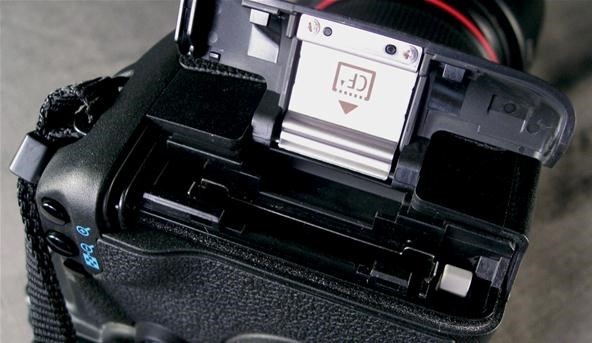 After you've fully charged it, open the battery compartment cover on the bottom of the 5D Mark II. There's a tiny lever that you need to slide toward the opposite end of the camera (follow the arrow) with your fingernail. Holding the lever in place, pull on the cover to open it. Again, use the tiny illustration on the underside of the cover to learn which way the battery goes in. Install the battery with the contacts facing down into the camera's recess. Push down until it snaps into place (the battery release lever will hold it down securely). Close the cover by pushing it shut, until it snaps. Before formatting your CF card, make sure everything that you want to keep on it is transferred to you computer, because everything will be erased. 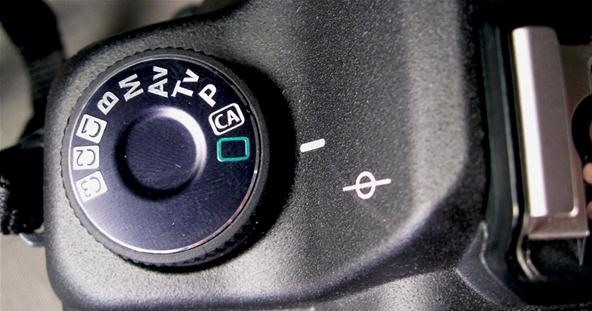 On your camera, turn the power switch to the ON or L position. Press the MENU button and wait for the menu to appear on the LCD monitor, then use the multi-controller to navigate left or right until you land on the first wrench icon (fourth icon from left). Use the Quick Control Dial (QCD) to select Format. A warning screen warns you that all of your data will be lost by formatting the card. Use the QCD to select OK. Then, press the Set button (in the middle of the QCD) to start formatting. After formatting is complete, the menu will appear again. All of your digital photographs are stamped with the time and date for which you shot them, which makes it easy to manage on your computer after transfer. But you need to make sure you have the correct time and date set. On the menu screen, use the multi-controller to navigate to the second wrench icon (second icon from right). Use the QCD to select Date/Time and press the Set button. Use the QCD to select the number you want to change, then press Set. Turn the QCD again until you get the number you want and press Set again to lock it in. Do this until all six numbers are correct. When finished, use the QCD to select OK and press Set. While still in the camera's menu, it's a good idea to go ahead and set your image quality. If you're just starting out, it's best to just stick with a JPEG setting. The highest quality setting for JPEG is JPEG Fine Large. If you're a professional ready to jump right into RAW files, the best quality is simply RAW. Both RAW and JPEG Fine Large are 21M and 5616 x 3744 pixels. But you can also pick smaller sizes and combinations of JPEG and RAW. Figure out what you want, then navigate to the first icon in the menu, the one of the camera. Use the QCD to select Quality and press Set. Then use the QCD to select your JPEG choice and the main dial by the Shutter button to choose the RAW setting. Once you've got what you want, press Set. Close the menu by pressing the MENU button, or by simply waiting for it to turn off automatically. For some of you, the built-in eyepiece diopter may be perfectly suited to your eye. If you wear contacts or have perfect vision, you probably won't have to mess with it. But if you wear glasses and want to shoot without them, you can by taking advantage of the diopter adjuster knob, which varies from -3 to +1 correction. 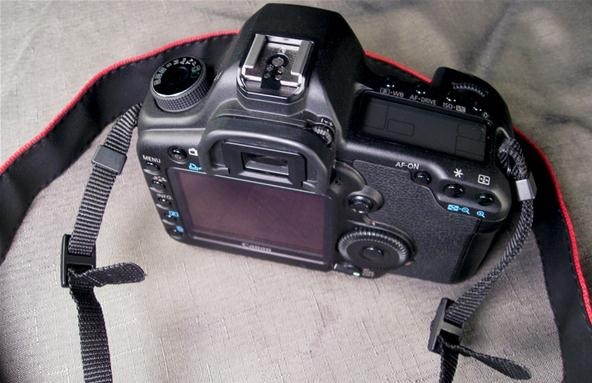 With your 5D Mark II in the ON or L position, remove the front lens cap and look through the viewfinder eyepiece. 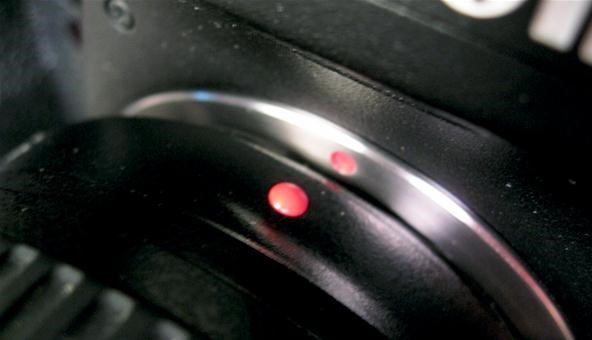 Press the Shutter bottom on the top of the camera halfway down until the red indicators in the viewfinder are visible. Rotate the dioptric adjustment wheel above the viewfinder left or right until the red dots appear sharp and crisp. If you have a hard time adjusting it based on the nine red focusing dots, try focusing on a brightly lit object with lots of detail, and adjust until it feels right. If you're just starting out with DSLR photography, it's best just to stick with FULL AUTO mode. Set the MODE DIAL to FULL AUTO (the green icon) and all of the necessary camera settings will be set automatically for you. All you need to do is point, focus, and shoot. Press the Shutter button halfway down to focus on your subject, then press it down all of the way to snap the picture. Simple as that. You'll hear the shutter sound and see the shutter close in the viewfinder, and when the picture has been properly recorded on the CF card, the image will appear on the LCD monitor for about 2 seconds, so you can quickly preview it. To display the image again, or to see all of the ones you've taken, press the PLAY button to the left of the monitor. And that's it. Now just start practicing in autofocus mode until you're ready for more advanced options. Wow, this world has really started going! why did you guys choose the 5D? Because it's a great camera, there's not a lot of free information out there for it... and I just happen to have one! so mine is just showing a tiny picture and the info in the image..I want it to go back to showing a full image of the pic I just took when I hit review..can't seem to figure this out..please help! !